Percutaneous balloon valvuloplasty is a procedure to improve a heart valve. A balloon will help to open a stiff heart valve. This procedure is done to improve blood flow through a heart valve. It is done to treat a condition called stenosis . Better blood flow will relieve symptoms. For most, the improvement will last at least 2 years. This procedure is not appropriate for all stenosis. Some will require open heart surgery instead. There are many tests that will be done before the procedure. They will help determine your heart health and valve damage. Local anesthesia will numb the area. Sedation medicine will help you relax. You will be lying down in a special procedure room. There will be x-ray machines and surgical equipment. A blood vessel in your groin or arm will be prepared. A wire will be placed through your skin to the blood vessel. It will be passed through the blood vessel until it reaches the heart valve. The doctor can watch the progress of wire with the x-rays. A tube with a balloon tip will be passed over the wire. A dye may be injected through the device. This will help the doctor see the area and make sure the device is in the right place. The balloon will then be inflated and deflated. The inflation may need to be repeated. The device will then be removed from the blood vessel. A dressing will be placed over the puncture site. You may need to lie still and flat on your back for a little while. A pressure dressing may be placed over the puncture area. You may feel some discomfort when the balloon is inflated. It is usually minor. Most people are kept overnight. The medical team will monitor for any complications. Your doctor may choose to keep you longer if problems arise. Time to recover is short. There will be a bandage over the puncture site. Strenuous activities will be limited for a short time. The doctor will need to recheck progress in several days to weeks later. A blood thinner may also be needed. Balloon valvuloplasty. Encyclopedia of Surgery website. Available at: http://www.surgeryencyclopedia.com/A-Ce/Balloon-Valvuloplasty.html. Accessed September 15, 2017. 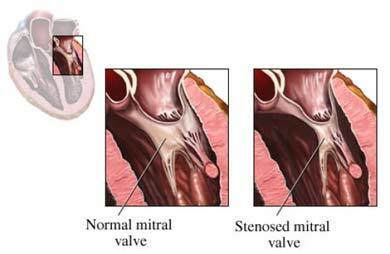 Mitral valve stenosis. EBSCO DynaMed Plus website. Available at: http://www.dynamed.com/topics/dmp~AN~T115920/Mitral-stenosis . Updated May 31, 2017. Accessed September 15, 2017. Valvuloplasty. John Hopkins Medicine website. Available at: http://www.hopkinsmedicine.org/healthlibrary/test%5Fprocedures/cardiovascular/valvuloplasty%5F92,P07990. Updated September 15, 2017.